Spear’s “The Jolly Game of Old Maid” was introduced around 1900 and comes in many sizes and card qualities. The images on the cards contain some interesting but harmless social stereotypes from the end of the Victorian era, mostly in a “jolly” mood, with matching comical names. There are plenty of funny characters, costumes and an early bicycle. The main focus of the game is towards the last card, an Old Maid shown here having tea with three cats and a parrot. The player who ends up holding this card is the loser. The edition shown here, from around 1910, is reckoned on the box to be an “Improved Edition”. This probably refers to the print quality and more rounded corners than earlier editions. The backs are still plain pink. 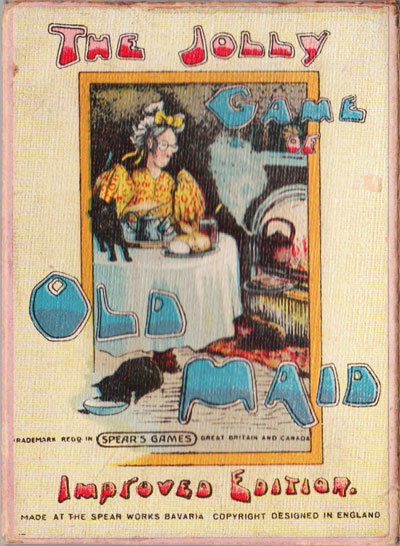 Above: the Jolly Game of Old Maid published by Spear's Games, c.1910, manufactured at the Spear Works in Bavaria. Images courtesy Rex Pitts.